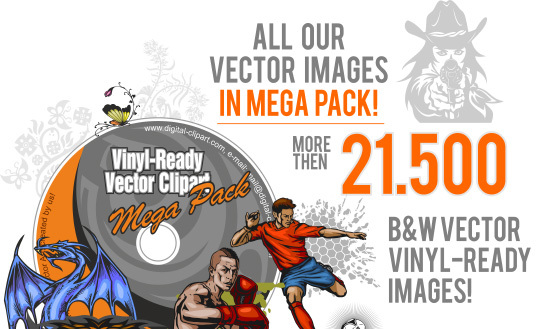 Digital-Clipart - All Cuttable Vector ClipArt (EPS,AI) in one DVD disk! Each buyer of the DVD-version or CD-version, receives the personal paper certificate (with a name of the buyer), and with the signature of the president of company Digital-Clipart. Digital-Clipart. Sold by 2CheckOut.com Inc.
( Ohio , USA ). for the purchase of CD-version. All the images are created by experienced artists, and help achieve the best results. The images have a wide range of application, including vinyl cutting, laser etching, screen printing, desktop publishing, tattoo-design, web-design, flash-animation etc. You get a unique product at a very fair price, paying no license fee!